CraftingEz6 Coding - Page 19 of 19 - All about coding. Java coding, OOP coding, any coding oriented, especially Java. Here lies java coding, theory and algorithm. Example of real-life coding, and of course Application or even Games. Hello, how are you doing? well i am fine of course!. 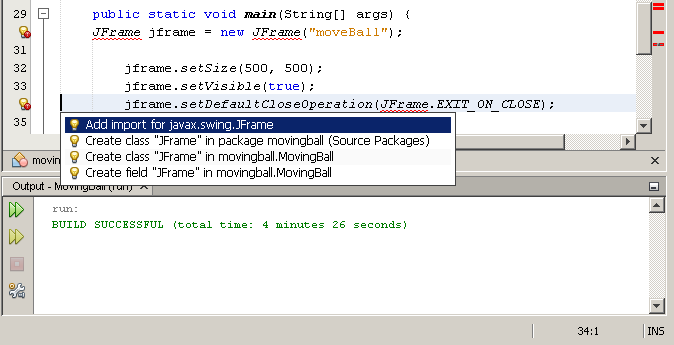 Now lets get to the fun part of Coding, making a Program, now we’re going to make a moving ball in java. I know that program like that is small and doesn’t contain anything much spesial but we need to get an exercise at Coding. 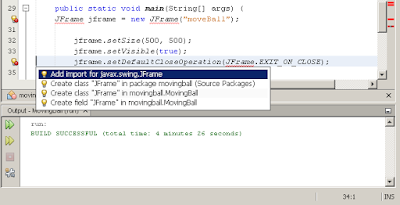 For this “tutorial” i will tell you step by step on how to make a ball moving in your program, now I will use netbeans for the IDE. Does netbeans and IDE sound familliar for you? 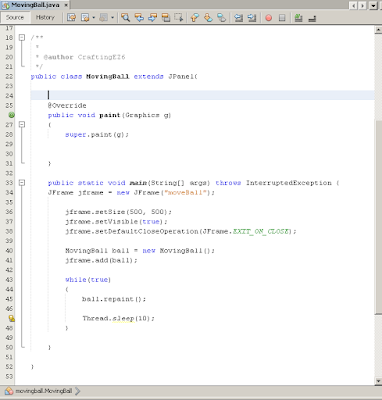 maybe some of you are, but for you who don’t netbeans is an IDE, an IDE is a development environment for programming, we talk about it in my last post which is Coding Syntax. first if there is any mistake i apologize and any knowledge or help would be nice. now forget the chit-chat and lets begin! and because you don’t have any project yet you will have empty netbeans like this. 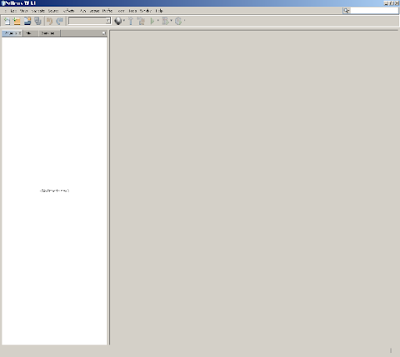 after you open it you need to make a new project, which is a java project the way to open it is you click “file->New Project” after that you choose the folder “Java” and choose “Java Application” after that click next and now there will be a box that you need to fill, now you fill it with your project name, I will use “Moving Ball” you can name it whatever you want, the project location and the project folder. and you need to import the “Graphics” just like you import JFrame the only thing different is you need to choose the option “add import for java.awt.Graphics”. Now in the next part well create the method to make the ball “Move” and finish our program. Hello, how are you? i’m well fine in this sunday, first i apologize if there is any mistake any help or knowledge would be nice. From our last journey in the world of Coding syntax we take a little peak about syntax and it’s example we learn that variables are also part of the Coding syntax, and we also have IDEs that help us to start coding easily with it’s sytax helper. Now we’re about to talk the #3 thing which is the algorithm of Coding. algorithm is a set of steps or any problem solving to accomplish somekind of task. those 4 step for cycling to home is an algorithm, how? algorithm is a set of steps to accomplish a task well those 4 are the steps to accomplish the task, we could make question to determine whether it is an algorithm or not. 1st what is the task? cycling to home, 2nd what is the steps? those 4 steps above. Now how do you feel, do you get more comfortable at algorithm or more confused? I hope you get more comfortable in this. Now just imagine that you have 1.5 million integer between 1 and 15 and you need to sort those integer, well the right sorting algorithm to use is Bin sort, if you would have 2 million book titles for the best algorithms it goes with the Quicksort. Give comment, help you and me grow our knowledge together. Tips, Help and Knowledge would really be appreciated. Thank you, see you on another Article. Hello, how are you? i’m well fine in this saturday, first i apologize if there is any mistake any help or knowledge would be nice. Resuming from my last article, last time we talk about Coding Variables, specifically Java Variables what a discussion we had last time eih?. Now, on this brightful day we will continue our discussion or talk for the #2 thing which is Coding Syntax. On the next article we’ll have a talk about Coding or Programming Algorithm. Syntax of programming language are the set of rules that define the combination of symbols in an exact form that the computer expects and considered to be correctly structured programs in that language itself . The expected form is called Syntax (in Computer Science, don’t get confused with general syntax). In the definition above you’ll see some sentence like “correctly structured” and “symbol“, what does this means? let’s say it that syntax is a certain layout of words and symbols. for example, if you want to acces a certain web page what would you type in the address bar? let’s pretend that you type , www.webhostingallinone.com what would make you so sure that what you type would go to a web page instead to an email address? it’s because of the “www“(that stands for world wide web) and followed by a website domain “webhostingallinone.com” and because it is considered to be correctly structured to the internet and to a web. Well in programming language it’s just the same, there are rules that are set in place when you obey them you will make some kind of functioning program, but beware if you don’t follow the rules and placement, xO error pops up. There are 4 parts of Syntax that needs to be explained here. First, the “int“, this part stands for the Integer type of variable, remember the String, Integer and Double we talk last time? Integer are suppose to contain whole number, nothing else. Second, the “first_number“, this part stands for the name of the variable, a variable name could use word and numbers but the only special character it could contain is ( _ ) an underscores, usually in the Java world variable name front letter are lowercase letter, well they don’t have to but that is usually the kind of accepted and sugested convention(in Java world). Third, value “10″ (don’t mind the quotes), this part of the sytax is use to place the value of the variable, since the variable is int then you can only use whole number only. Then, the last part of the Syntax the “;” a semicolon this special characters will always be at a Syntax, because it is the thing that mark some particular segment is complete for the computer to process. There are exception for what I said that semicolon will always be at a Syntax, that is controle structures they uses curly brackets to make the beginning and the end of a segment. Just imagine coding semicolon as a normal period writing, if we don’t put any period the writing will not be structured and will not be easy to read. When you enter the coding or programming world, you will likely see syntax as one of the biggest battle to master. But, as you see more and more code and introduced to more and more syntax you will get yourself finally comfortable, but this will not be a short journey it will take a step at a time. Well there is a great great good new for the people that see sytax tough, and for so a goe companies (group of enthusiasts, a.k.a nerd or noob (no offense i’m a noob too but slightly improved)). There is hope for us, now companies have made a tools to do sytax thing in coding, those tools are called IDEs or, Integrated Development Environments, which you can download onto your computer most are free like the Java Eclipse and Netbeans I mention in the last post, you can use it to create programs. These IDEs have built in syntax checkers (much like the grammar checker in MS Word) that will let you know if your syntax is incorrect or correct, and will even give you hints with what it thinks you meant to put!. Hello, how are you doing? well i am very fine indeed in this fresh morning, first i want to tell you that i’m not the master of Coding because i’m still learning, excuse me if I made mistakes so any helpful knowledge would help. Now we’re going to talk about the base of Programming or Coding, specifically in Java. Program or Codes are based out of Variables, Syntax, Algorithm, etc.. (well that is more or less). Now i’m going to explain the #1 which is Variables. Variable are a symbolic name that contains or store information that are going to be referenced and used by the programs, The variable name usually represents what the variable contains. In Java there are 3 types of variable, that is: String, Integer and Double variable, These 3 variable uses different name because it contains different types of Data. The simple explanation is, if you wanna store your name in a variable, the type of variable you use is String. Or, maybe you wanna store you age in the variable, in that case you use Integer. Or even you wanna store how much money you make in a month, that type of data is stored as a Double. Don’t get confused here, you might ask, Why the heck does Java uses three variables instead of just one.Well, good question there, Java is a Strongly Typed Languange. Which means that Typing in Java will be absolute certainity that the information you stored in the variables are in a “certain way”.. so it will be very specific, it will give you error if the stored information does not match the type it suppose to be. Just like I say before, if you wanna store your name in a variable which is a String, the informations that is stored would be like this, “Rafif Santika”, a String would make any data treated like an old plain English languange, a String would represents data as a Words (or specifically a Letter). It may come in your life as a programmer, that you would add two sentences or two Strings together. So, what does it means to add two sentences or two Strings together? You see, if you have 2 Strings variable, one of them contains the data “42” and the other one “3”, if you add them together what would you get? if you say “45” , then Great!!. what would happen to them if we add two of them? hopefully your natural instinct would say “Hello World!”(Haha!). The same thing happen to “42” and “3”.. Java behaves or treats the data differently because the different Type of variable. if your output result is like that, Then you have Suceeded. if your output result is like that, Then you have Suceeded at double variable. Give comment, help you and me grow our knowledge together. Tips, Counsel and Knowledge would really be appreciated. Thank you, see you on another Article. Morning!, Afternoon!, Evening! depending on when you read this post. You see, there is plenty ways or place for you to learn about code stuff, when I say plenty I mean A lot! A lot!. Now i’m going to tell you a story about how I get myself to the world of Coding or Computer Programming. After that, I started my research on Coding. I watch videos about it, I read programmers biography and one of the biography I read is Bill Gates, the founder of Microsoft. That video make my spirit even higher. You see, in that video they say “You don’t need to be a genius to write codes!” So there is an equal chance for everyone to learn code and SUCEED, it just depends on your passion and your desire. After that I started to take learning on Code.org (By the way it’s free for everyone) taking my skill to a higher level, in Code.org I start learning on the Hour of code it’s very unique type of learning that i never see before, it even had courses for 3rd grade, wait it might be 2nd grade. In Code.org I learn so much, much more at that time. My knowledge improve, my syntax improve and my algorithym is improved. It takes me about a year now, to learn at KA and yet I still need to learn more because I need to master it. So, until now at grade 7 I still learn at KA, but!! 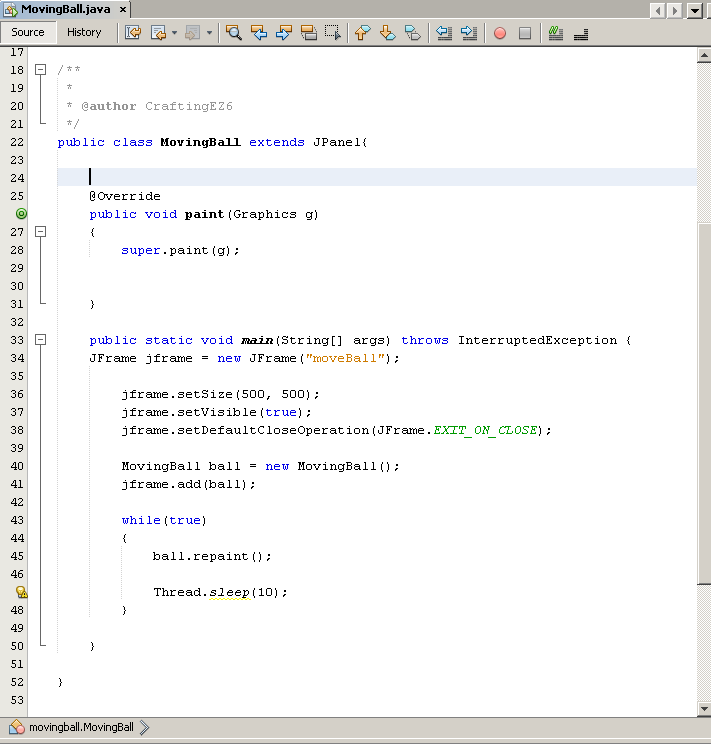 besides learning at KA now I learn much more complicated coding at JAVA, i’m using Java EE Eclipse to write my code. Because I want to focus on making game, so I watch videos on Youtube on how to make games in java, now i am writing PONG games which is halfly done, and I will finished it and makes improvements soon. So, that’s my story about how I get to the world of Coding. Well maybe our experience and our story is different, but we have one similarity, we LEARN. Everything that I metioned up there is about how I learn, learn and learn!. Well learning on how to code will not be just a moment or two, it takes a lot of hour until you mastered it, so I am very grateful that i learn coding since I was just a boy so I can have a lot of times to Learn. That’s all of the story that I can tell you, hope you get something from our talk, and I recommend that you check the book and those 2 places. But in the end you need to pick one.Bye and see you next time! Do you have any other experiences? Give comment and share it with other people! I hope this first article could tell you how I plan for the future of this blog and improve my coding skills because i’m still learning too. I hope throughout this blog I could give people knowledge and I hope through every single post I could be better and better.